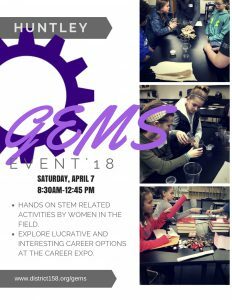 All Huntley 158 middle school girls are invited to attend the second annual Girls in Engineering, Math, and Science (GEMS) event at Huntley High School on Saturday, April 7. At the event, running from 8:30 a.m. to 12:45 p.m., participants will take part in hands-on STEM-related activities led by women in the field. In addition, participants will explore lucrative and interesting career options at a career expo. The cost is $15 and includes a t-shirt. Space is limited to the first 120 registrants. Participants can register via the District 158 Web Store. In the Web Store, select your middle school, then select GEMS to complete registration. For questions or more information, contact Laura Jenkins at ljenkins@district158.org or Amanda Henk at ahenk@district158.org.